Parr Meadows was a five eights mile quarter horse track located in Yaphank about fifty miles from Elmont, the home of Belmont Park making it the Eastern most track in New York. The track had a long chute for races up to 440 yards, longer races were run around two turns. The grandstand and clubhouse were glass enclosed including a restaurant with seating for 25,000 quite spacious for an unproven venue. There were accounts that during that first summer the Southampton crowd would take bar equipped buses to Parr Meadows for a night of racing. The stable area had room for 800 horses. The history of Parr Meadows, could only be classified as a tragedy. From the get go there were nothing but problems. 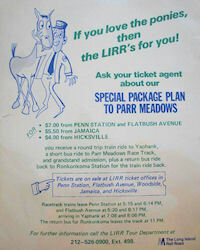 The original name for the track was to be Suffolk Meadows, but after years of problems the original owners bailed and the project was taken over by Ronald Parr, who obviously named the new track after himself. Opening night in May of 1977 drew an estimated 15,000 fans to the first quarter horse track in New York, many probably never returned. Those first night patrons were probably a little surprised when they went to get a seat in the grandstand to find only metal posts sticking out of the concrete, it seems the seats to go with them never arrived. Another thing the crowd didn't know was that the track almost had no money, the armored car bringing their cash got lost and only arrived minutes before post, delaying the first post by twenty minutes. It would also be two weeks before the restaurant opened. Parr Meadows never made it through that first season, financial issues forced Ronald Parr to close the track when he couldn't secure enough financing to keep the track afloat, it was rumored that he even tried to get money from organized crime. The track would remain idle for nine years when another attempt at quarter horse racing was attempted. In 1986 everything came full circle, Suffolk Meadows was a reality, unfortunately the original name was not enough to get people excited and the new Parr Meadows fared no better than the old Parr Meadows, folding up before they too completed a full season, what where they thinking? Ironically Parr Meadows may be best known for an event not involving horses. In 1979, a crowd of 18,000 showed up for a ten year Woodstock anniversary concert, featuring many of the original performers. Today the track has been demolished, but it's problems still remain, as no one has been able to develop the site, not for the lack of trying. I personally never attended Parr Meadows, but did take notice of it back in 1977. Having some exposure to quarter horse racing out west, I was curious whether it would catch on east of the Mississippi, but it seemed quarter horse racing in the east had the same appeal as harness racing out west.